With 37 years of experience, Donna Collins is ready to help you get your taxes done quickly and done right with local people you know and trust. 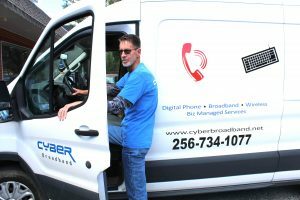 Call for an appointment in Haleyville at 205-485-1040, 1509 11 Avenue and in Hamilton 205-921-3311, 1500 Military Street. 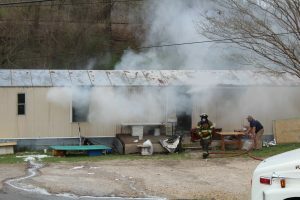 The Haleyville Fire Department responded to a house fire at 1850 Haley Avenue around 1 p.m. Sunday afternoon, March 24. The young couple who lived there was not at home at the time of the fire. The mobile home was a Ricky White rental. There were extensive fire, smoke, and water damage. The cause of the fire is unknown at this time. A single-vehicle crash at 7:25 a.m. Saturday, March 23, has claimed the life of a Haleyville woman. Diana Lynn Wyllie, 69, was killed when the 2018 Harley Davidson motorcycle, she was a passenger on, left the roadway and struck a culvert. The driver of the motorcycle was transported to North Alabama Regional Medical Center in Florence. 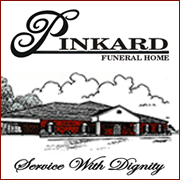 Wyllie was pronounced dead at Lakeland Hospital in Haleyville. The crash occurred on Dime Road, approximately five miles north of Haleyville. Nothing further is available as Alabama State Troopers continue to investigate. The Haleyville City Council met Monday afternoon, March 18 for the regular bi-monthly meeting with all members except Drew Thrasher. After approving the minutes of the last meeting, the Council approved the general operation bills and purchase orders for February in the amount of $463, 081.76. The Council passed a resolution soliciting bids for a drainage project in Forest Park. A second resolution was approved which authorizes an agreement with Mallory Burkhalter to repair potholes and do street patching on 20th Street from 12th Avenue to 20th Avenue, 15th Avenue from Highway 195 to 28th Street, and 30th Street from State Highway 195 to Newburg Road. Total cost for a two-day project is $20,560. The next scheduled meeting of the Haleyville City Council will be Monday, April 1, 5:30 p.m. at the Haleyville City Hall. 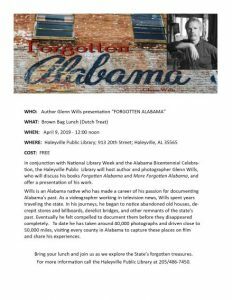 The public is always invited. A single vehicle crash at 3:05 p.m., March 18, 2019, has claimed the life of a Haleyville woman. Carolyn P. Nicholson, 71, was killed when the F-250 pickup truck she was driving left the road and struck a tree on County Road 93 in Franklin County. 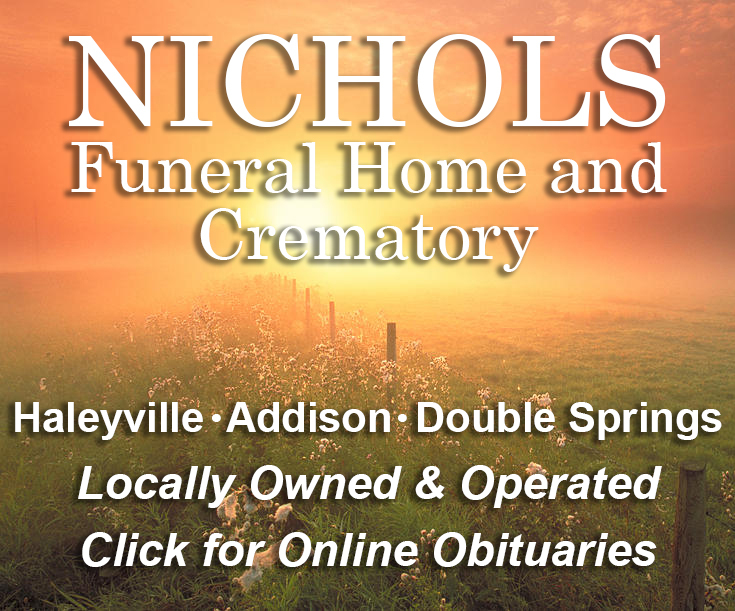 Nicholson was med-flighted to Huntsville Hospital where she was pronounced dead. 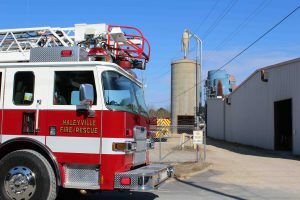 The Haleyville Fire Department responded to a call of a dust bin fire at Masonite Monday morning just after 9 a.m. There was a fire but not in the dust bin. Reportedly, the fire was in a construction trailer which belonged to a roofing contractor. The fire was quickly extinguished with some fire damage. An abandoned or unoccupied house at 1581 CR 3435 (old Highway 195) was left with a couple of walls standing, but otherwise was considered a total loss. 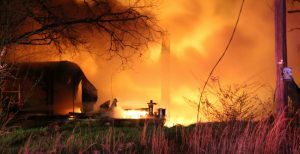 A passerby on Highway 195 saw flames from the burning house and called 9-1-1 before 11 p.m. Wednesday night, March 13. When the Pebble Fire Department arrived, they called for backup from Haleyville and Ashridge. Even with high winds, the firemen quickly extinguished the blaze. The cause of the fire is unknown.